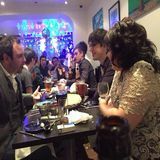 "Best Indian Restaurant in Brick Lane London E1 Bengal Village Indian restaurant offers a more sophisticated dining experience for those who are seeking to explore beyond the ordinary and discover the full potential of Indian fine dining. Order Indian & Bangladeshi takeaway food online at Bengal Village & get discount!" Banglatown International Curry Festival Award 2007. What did you think of Bengal Village? 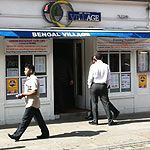 Bengal Village is along Brick Lane and is a really good, authentic Indian place. Lots of really spicy dishes and it's all reasonably priced. I like the Lamb Chops of Bengal Village. You can try it. Delicious Indian food and services I must admit. If you are looking for a traditional Indian restaurant to have a lunch or dinner, you can surely book a table in Bengal Village. I''m sure that you will get great value of your money. I recently came to Brick Lane and heard about the amazing curries that are made here, who doesn't love curries?! We then came across Bengal Village and were intrigued by the great offers! Must say we did not make a mistake not going in, the food was delicious and proper home cooked! I would definitely recommend others to go. Bengal Village, we surely will be coming again! We were almost pulled in by the tout here following a brawl with the neighbouring restaurnteurs. The offer we got was too good to miss so we thought we would give this restaurant a try as we have never tried it before. From the onset looks cozy and welcoming, inside it looks like a canteen. Uncomfortable chairs and tightly squeezed tables was not what he were looking for but still stayed. The cold gush of air that hits you the moment the door opens was still not enough of a banter to make us leave as the deal forced us to be glued to our chair. The drinks which were offered for free seemed watered down and the food was one of the worst I had in ages and I am a regular diner! What made it worst was the constant sarcastic comments made by the waiter/ tout. He might think he was funny but we were almost going to leave without paying. The experience could have been a lot better should he have not intervened in our personal conversation and fed his views. Brick Lane is full of people like this and for this reason alone I shall not be dining anywhere along Brick Lane for the foreseeable future. Bengal village is my favourite restaurant in bricklane. have been going there for years! they always give good service and give me good discount.The food has so much flavour and makes me crave more. The price is worth it! maybe more comfortable seating ? Curry was OK, service was appalling. Waiter possibly drunk over exerted his ordering skills at the table. Felt very uncomfortable with his cheeky smerk and comments. Wont be visiting again. 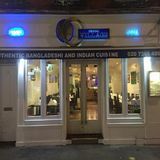 Excellent Restaurant.Full of flavours.Lovely Waiters.Wonderful Service.Always go to this restaurant one of the best in brick lane.Nothing bad about this restaurant.Would recommend this restaurant to Everyone. Excellent service but poor food and ambiance. This venue was the only restaurant not touting for custom so we thought we would give this a go. The restaurant is on the small side however with big personalities. The waiters are professional and well spoken with good knowledge of the dishes. The food lacked flavour and seasoning. Prices were also extortionate. Having read the wonderful View London Review on this restaurant we went to try what we assumed to be the finest Brick Lane had to offer. Well it all went wrong. The restaurant is small, squashy and cramped. Seats are made of steel and look similar to those available in prisons. The menu is over-priced which explained why they were so happy to offer us 30% off the bill. There is an unexplained service charge added before the discount is applied which means that in reality you get 15-20%, clever marketing tactics. The food was medicure at best and luke warm. We have tried better places in Brick Lane. The Shampan is far better in all aspects in comparison. Decor is poor. Wine list below average. Toilets are a disaster. Ambience and atmosphere very dull. I wouldn't come to Bengal Village again nor would I recommend it. The staff and management are rude and only care about turnover in Bengal Village. Had booked a table here, was never told there was a time limit on it and after having had terrible service from grumpy waiters, poor food (very small portions and nothing special), we were very aggressively told to leave as the table was booked for someone else! Shocking! Don't go to Bengal Village, there are a lot nicer places in Brick Lane to go! We enjoyed our meal at the Bengal Village, although the portions were quite small in comparison to other indian restaurants, and the whole place is buzzing and friendly. However, check your bill carefully as ours was fairly expensive and when we went through it drinks had been added that we didn't order. We queried this and although it was amended it was still incorrect - quite a pricey night out! Best place on Brick Lane by a mile, been going there 8 years. Friendly staff, extensive menu, competitive prices. Vegetable thali is good to build a big meal around for several guests. King prawn jeera, garka lamb and the wonderful Bengali speciality - keski mas bhuna (like a whitebait curry) - are standouts. Butter nan, some pilau rice and you've just nailed the best feed east of Buckingham Palace. This was my first visit to Brick Lane and I really enjoyed my curry in the Bengal Village. The decor was modern and the staff friendly. My jalfrezi was nice and spicy but my friend likes a mild curry - which she also enjoyed. Prices very reasonable. Recommended. Visited Bengal Village last Friday evening and had a great experience. They had friendly staff, fabulous food and stylish decor - none of the traditional curry house gaudiness here. Be sure to book as the place was packed though. Only negative at Bengal Village was the noisy Anzacs in the corner but you can't blame the restaurant for that! Although there was no one else in Bengal Village when we visited today, our server was impatient and rude and the plates were dirty & service was slow. When the food finally arrived, the portions were small and the food was unappealing. My Thali was £13 yet had less food than if I had ordered a separate curry, rice and naan which would have been two thirds of the price! The lamb looked as though it was bruised and old. I was not able to eat my food, yet when I complained, the staff refused to take the meal off the bill and started to shout at me. This place is horrific...the worst dining experience I have had in London. Avoid the Bengal Village at all costs. Priding itself on serving authentic homemade Bangladeshi food, Bengal Village is worth a visit on London’s famous - and famously hit and miss - curry capital. Bengal Village looks like any other curry house on Brick Lane, with the strong scent of curry wafting out from within and an exterior that suggests they let the food do the talking. It’s bright and roomy inside with simple table and chairs and plain decor. You’ll be welcomed right through the doors of this Bangladeshi restaurant, with its friendly and polite service and buzz of conversation from friends meeting up for dinner. As usual with Brick Lane, the clientele is made up of tourists, out of towners and Londoners looking for a decent, affordable curry. There’s great variety on the menu which can make choosing what to eat a little tricky. Start with grilled tikka or tandoori pieces, samosas, bajees or just a few popadoms before you move swiftly on to the mains. 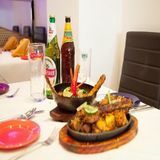 If you’re in a large group, it might be worthwhile sharing the tandoori mix grill platter, comprising chicken tikka, spicy sheek kebab, tandoori chicken, king prawns, mutton tikka and extra tender lamb chops - an ensemble of spicy, tangy flavours that are perfect with a squeeze of lemon for extra zest. 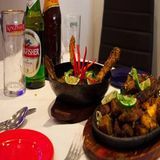 Starters are mainly priced about £7 and up to £12 for larger, sharing dishes. Now on the mains. Again, with larger groups you may want to select a variety so you can try lots from the extensive menu. Recommended is the lamb chop karai moss - the meat is really well cooked so it falls off the bone, and the sauce is rich and perfectly spiced, cooked in a cast iron wok skillet with plenty of garlic and ground spices. Other recommendations include the lamb jeera and shatkora chicken. The fish koftka sounds intriguing and comprises large, dumpling-esque balls of fish in a spiced, tomato-flavoured sauce. However, on slicing through one of the koftka balls, it’s hard to decipher what type of fish is contained within its spherical shape - and it tastes pretty unspecific too, which is not a good thing. If you’re sharing there are plenty of side options to pick from too, with naans and pilau rice being reliably good. Mains are at the £7-£11 mark. If you’re feeling adventurous, try one of the more traditional desserts (which many of the other Brick Lane restaurants fail to include). Gulab Jam is made with milk and flour and deep fried, then served in a honeyed sugar syrup with hints of rose water, saffron and cardamom. To suit less adventurous tastes there are sorbets and ice creams as well, priced at about £2-£3. The House options of wine are perfectly adequate, although there is a longer list available as well as various beers and soft drinks, including the popular lassi yoghurt drink - perfect if you need to cool down after too much spice. Bengal Village is more traditional than a lot of the copycat curry houses on Brick Lane so it’s definitely worth a try for richer, more exciting flavours served with pride.